It was another special occasion for the brethren of Lodge of Harmony No 580 and their guests, who had gathered at Ormskirk Masonic Hall to witness the installation of John Rogers as their WM. 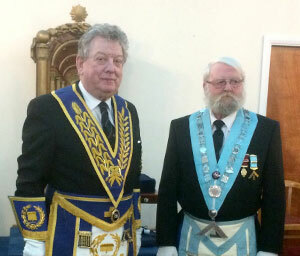 Ian Gee (left) with the new WM John Rogers. For the evening’s ceremony the lodge was honoured by the presence of Ian Gee as their principal guest. Ian was accompanied by the Ormskirk and Bootle Group Chairman Graham Chambers, vice-chairman Malcolm Alexander, grand officer Roy Worthington and acting Provincial grand officer Rick Walker. The outgoing and installing WM, Anthony Prior started the evening’s proceedings by warmly welcoming the brethren and visitors to the meeting, before opening the lodge. After the initial lodge business was completed; the director of ceremonies Robert Hales announced that Ian Gee was without and sought admission. Ian was then admitted into the temple accompanied by the grand and acting Provincial grand officers, where Anthony had the great pleasure of warmly welcoming Ian to the ceremony. Anthony asked Stephen Brereton if he’ll remain in the chair of senior warden, William Cropper if he’d occupy the chair of junior warden and Trevor Tomlinson to act as the inner guard. Anthony then proceeded to install John, according to ancient custom into the chair of King Solomon. The working tools for an installed master were presented by David Williams, the third degree tools by Alan Johnson, the second degree tools by Alan Browne and the first degree tools by Anthony Prior, all in an excellent and proficient manner. While the officers were being installed the address to the junior warden was delivered by William Cropper, the address to the secretary, treasurer and DC by Robert Hales and the address to the ADC by Alan Browne. The warrant and by-laws of the lodge were presented to the WM by Robert Hales. 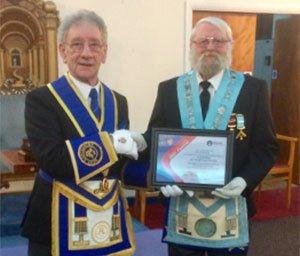 Malcolm Sandywell (left) presents John Rogers with the Vice-Patronage MCF 2021 Festival certificate. The address to the WM was given by Roy Worthington, the address to the wardens by Alan Browne and the address to the brethren of the lodge was delivered by Ian Gee, again the addresses were all delivered in a confident and excellent manner. At the end the ceremony of installation, Ian addressed the brethren and brought the congratulations from the Provincial Grand Master Tony Harrison, wishing John and all the brethren the very best of health and hoping they all have a happy Masonic year. Ian then congratulated Anthony Prior for the excellent manner in which he had installed John into the chair. Ian then congratulated the lodge’s new DC Alan Browne and new ADC Robert Hales, whom both had swapped offices that evening and equally split the work that evening between themselves and all the brethren who had taken part in the ceremony. The ceremony now being completed, John presented Ian with five cheques for charity; £800 to the MCF 2021 Festival, £450 for Liverpool Alder Hey Babies’ Unit, £150 to Ormskirk Masonic Hall Building Improvement Fund, £100 to Tithebarn and £100 to There But Not There (WW1 100th anniversary), on behalf of the recipients Ian thanked the brethren of the lodge for their very kind and generous donations. After the cheque presentations the group charity steward, Malcolm Sandywell, stood up and asked Ian if he wished to present the lodge with their vice-patronage certificate on behalf of the MCF 2021 Festival, which Ian accepted and presented the certificate John. After closing the lodge in prayer and harmony the brethren made their way to an excellent festive board which consisted of black pudding as a starter, followed by roast beef and seasonal vegetables, apple pie and ice cream for dessert which was followed by coffee or tea and mints. During the festive board a raffle was held which raised £147 which will be donated to charities at a later date. The evening now at an end the brethren retired to go home, after having an enjoyable ceremony and festive board in good company. Pictured from left to right, are: Malcolm Alexander, Graham Chambers, Ian Gee, John Rogers, Anthony Prior and Rick Walker.